Not to disappoint those who prefer a Knight to a Bishop, we are going to investigate now what are the elements that make this minor piece a better weapon. As we mentioned in the previous article, there are no fixed rules to tell us when to keep a Knight and get rid of the Bishop. We have to always evaluate the position and, keeping in mind some basic ideas, decide which of the two minor pieces is superior in our given set up. Closed positions. Bishops have limited freedom of move in this type of structures, while knights can easily get to an eventual weak square in the position. Outposts in the center. Combined with a fixed pawn structure and a closed position, an outpost in the center will make the knight an incredibly strong piece, that will control the whole board. A knight can get even more irritating for your opponent if it can’t be challenged. For example, if your opponent has a light square bishop, it’s best to find an outpost on a dark square and vice versa. The presence of queens on the board. Knights cooperate better than bishops with the queen, as the two pieces complement each other and will control the position better. It is important to remember that the combination of knight and queen is very strong when launching an attack against your opponent’s king. It is the best piece to use when blocking a passed pawn. Note: In order to develop a positional understanding it is necessary to go over the annotated GM chess games, and to think why certain moves were made. Only when you put yourself in the the player’s shoes you will be able to fully understand the problems he was facing in the game and your will be able to improve you own chess. That’s exactly what you can do by studying our training course. Having set some guidelines, let’s see how grandmasters use the advantage of a superior knight in practice. The first example we are going to show is a game between two famous classics, Petrosian and Botvinnik. The position starts with a pawn up for white and an important decision to make – allow the trade of the minor pieces or return the material advantage. Weighing the alternatives, white decided to keep his strong knight and place it on a central light square, where, more importantly, can’t be challenged by black’s pieces. Next we are going to see yet another game of the great strategist Petrosian, this time against Robert Wade. In the starting position, black chooses a nice maneuver to force the trade of bishops and enter a position where the knight is better than the bishop. Later on, the game develops into an endgame where we can appreciate the strength of the queen and knight combination against a weak king. Another interesting idea in this game is the pawn sacrifice that Petrosian employs in order to gain an important outpost in the center for his knight. The next game, between Eliskases and Flohr, is an example of an endgame where the knight successfully blocks white’s passed pawn. It is very instructive to see how black keeps pushing his position, making white’s defense difficult. Even though the game could have been held to a draw, it is never easy to find the right continuation in a slightly worse endgame. Having highlighted the main situations when a knight is better than a bishop, we hope to have helped make your decision easier next time you have to choose between keeping a knight or a bishop on the board. Even though each piece has its strengths and its weaknesses, it is important to remember that, in the end, it is the board position that determines their value. 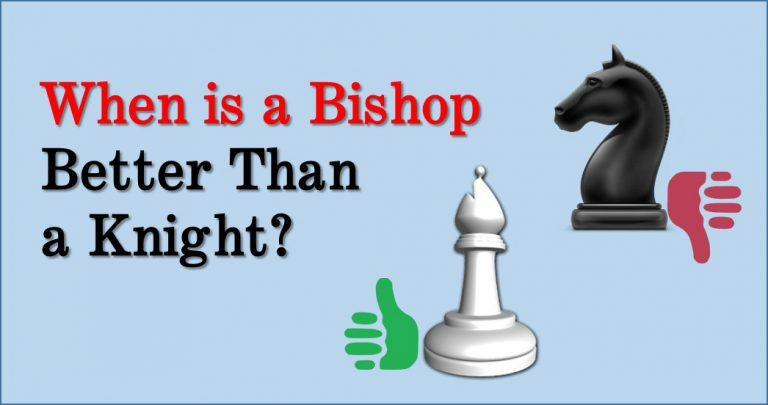 When a Bishop is Better Than a Knight?